Central Florida Aquarium Society’s (CFLAS) dedication to the preservation and expansion of the fishkeeping hobby began in 1967. In June of 2013, a refresh in leadership structure and personnel resulted in a paradigm shift that expanded its reach beyond the hobbyist community. A trailblazing, tech-savvy, and forward-thinking approach increased participation 2000% in the first 12 months. By January 2015, we have been able to share knowledge and be heard by nearly a half-million individuals per week. The variety of educational activities and innovative events CFLAS – both produces and sponsors – ensures individuals of all levels of interest feel welcome. These successes have garnered international and local recognition by media outlets and hobbyist publications alike, including USA Today, Newsweek, Huffington Post, The Blaze, World News, United Press International, io9, Yahoo!, Breitbart, Mirror, Gentside, Orlando Sentinel, Tampa Bay Times, Central Florida Top 5, Florida Leisure Magazine, The Daily City, Bungalower, as well as hobbyist publications Tropical Fish Hobbyist, Amazonas, Reefs.com, Reef2Reef, Drs. 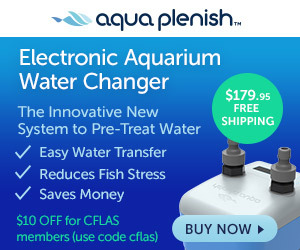 Foster and Smith, and LiveAquaria.com. It’s this formula that will lead CFLAS and the hobby to continued success and a brighter future. Our vision serves as the foundation for which our entire operation is built upon. Strong and stable framework guides every aspect of our business by describing the goals we must meet in order to continue achieving sustainable, quality growth. Since 1967, the Central Florida Aquarium Society has been focused on community. It is the people that make the difference, contributing their knowledge for the benefit of all within our hobby. We work to establish long-term, strategic partnerships with local business, acquiring sponsorship for events that are beneficial to all involved. It is the drive for success and continued learning that mold us to what we are now, and who we will be in the years to come. Our values are based around the golden rule. Treat everyone no different than how we would want to be treated – fairly and just. We are a firm believer in karma; delivering positive and knowledgeable content to the community. By working with others to achieve their goals, our own goals are met. We believe and practice that total transparency is key maintaining open community relations. We constantly think to create new ideas and concepts to fulfill or exceed the expectation of all stakeholders – Community members, sponsors, and team members. It is our synergy that allows us to establish relationships when we partner with our sponsors to deliver quality promotional events to the community. It is our passion for art that drives us to promote local artists, infusing culture into the hobby. It is our individual commitment to a group effort that defines our work ethics towards working as a team.